Just thought ya might wanna know. I swore I would never post at MetaFilter again, but I swear a lot without meaning it. My post for today resides here. And, only 4 more days left to vote in the Montana website awards; Git 'er done. We're in full on rush season, now, so time to post has been restricted. Consequently, I've been beaten to the punch on this story. I don't mind a bit, as long as people are aware of what's happening. 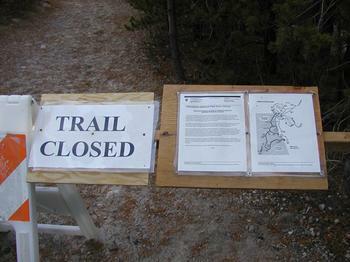 First encountered at the Daily Kos, comes this story about a possible change in National Park policy. Call me overly patient and cautious, but I think the Kos diary runs a touch to the paranoid side, (not that I would put one slimy back-handed trick above the greed of a Cheney friend). Kari Chisolm, at Western Democrat, picked it up as well, and I'm definitely on board for spreading the word. Please read and consider the L.A.Times article, and ask yourselves what you want from America's wild places, it's national parks. Though I wouldn't at all put it passed the Department of the Interior to deny us a voice in such a change of policy, forewarned is at least forearmed. I've long believed it impossible to live this close to Yellowstone and not become convinced that tourists can be complete idiots. The park is a dangerous place. 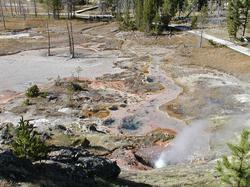 It is a seismically active volcanic region. That alone should give people the appropriate sense of caution. Couple that fact with the well publicized wildlife of Yellowstone, the ones with horns, hooves, claws and fangs, and you would expect the respectful tourist to keep their wits about them. Nope, doesn't seem to happen. Every year there are stories of people getting burned, gored, trampled or damaging themselves in what almost appears to be self destructive behavior. It seems that the Chronicle editorial staff agrees with me. Sadly, though, ours is an impotent rant. There isn't anything that can be done to keep people from being stupid. The stories that sadden me the most are those of dogs being scalded. Dogs can't read warning signs, but their owners can (including the signs prohibiting dogs from the dangerous areas). As I said, complete idiots. I consider myself somewhat creative, but there's no way I could make this stuff up. This Scientific American article made its way onto Metafilter. The article, titled "The Long Reach of the Wolf", discusses the unexpected side effects of the reintroduction of wolf packs into the Yellowstone ecosystem. It's a terrific article, so please read it. You'll have to forgive the smirky little smile I wear as I type this. To say that the effects of the wolf re-introduction were "unexpected" isn't entirely accurate. I know one man, at least, who had a pretty good idea of how wolves would not only benefit efforts at controlling elk populations, but how they would probably benefit the Park as a whole. That man is Alston Chase. Many people might have heard of him because of his more recent works, Harvard and the Unabomber: The Education of an American Terrorist, and his just released A Mind for Murder: The Education of the Unabomber and the Origins of Modern Terrorism. But most people around here know Alston Chase because of a book he wrote in 1986, which managed to piss off the US Park Service and the environmentalists (The Sierra Club, The Greater Yellowstone Coalition, etc.) in equal measure. 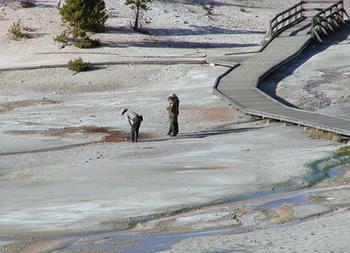 That book was Playing God in Yellowstone; the destruction of America's first national park. In that book, Chase offers a damning criticism of how profit motive and enviromental hysteria lead to the greatest mis-management fiasco in the history of American ecological effort ... a thesis well vindicated two short years later. For an excellent review of the book, try this one. I got to meet Alston Chase when I was a student here at MSU. He was a guest speaker and participant in one session of an honor's seminar I was taking at the time, (I think in 1991). I felt an instant affinity for the man: he's a classically trained philosopher (Harvard, Oxford and Princeton) who gave up his professorship to live in Montana, near Yellowstone. If it didn't sound so plebian, I'd say that he feels this area to his bones, kinda like I do. He's been a professor, an outfitter and hunting guide, as well as an author. And when I met him, I found that his philosophy understood things about which naturalists and biologists often seem clueless. When he spoke with us, he didn't bemoan the plight of the Grizzly, or the hunting of Bison, he lamented the dire straights in which we'd left the beaver in Yellowstone. 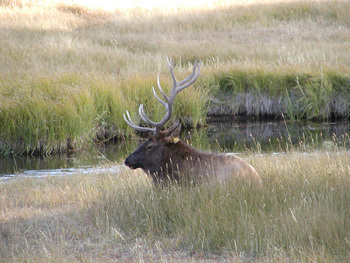 He talked of how massive elk populations were damaging the cottonwood and aspen groves, which supply the beaver with material, and help control the waterways, which in turn, fostered the nesting of birds, the control of insects (desease) and affected the movement of prey animals in and around the area. All of the biologists quoted in the Scientific American article can express their deep surprise or scowling cynicism at what the reintroduction of the wolf has caused. It doesn't surprise me. 13 years ago, a very wise man told me what the wolf could bring back to Yellowstone. I believed him then, and I still do. He told me then that humans are not nature's overlords, or stewards, or servants or caretakers. We are just another part of the whole that is nature, working in it, and certainly arrogant when we try to stand above or beyond it. This isn't a quote, but it's pretty close: Our politic is to see to our own place and let the rest adapt around us as we adapt around it. Forming nature to an ideal we have, damages nature, and since we're just a part of that, it damages us. I want to note this recent article pronouncing that the organization Defenders of Wildlife, which has done a terrific job of compensating those who lose livestock to natural predators, will no longer pay for those sheep killed in the Absoroka Beartooth Wilderness. That makes perfect sense to me, and I applaud their decision. My family tried twice to raise sheep, less than a mile from the mouth of Kootenai canyon in the Bitteroot. Both times, the sheep were lost to Black Bears (you can tell by the soupy mess they make of the carcass). We raised goats, cows pigs and fowl, without ever loosing one to a predator. Nature isn't gonna conform to our ideals, so we should use the ability we have to adapt. Anything else ... foolishness. This Guy. And his companion of course. It seems these two giants of reasoning decided that your Park actually belongs to them, for their joyriding-gunshooting-geyser harming enjoyment. Lets give 'em a big hand shall we? And I hope the Federal Prosecutor gives Yellowstone a nice hand out from these asshat's bank accounts. Why oh why do we accept such shabby treatment when others are exempt? Why were they allowed to wander where I cannot? I took this last weekend in Yellowstone National Park. My beloved and I go there as often as possible. She says its about the only place where I am at peace. I don't know if she's right, but I do love that Park. I'm posting this now, because we're going to the West Thumb Basin of the Park tomorrow.